Kote will protect your hand and arm from hits. Kote is copy of historical hand armor used in Japan. 1.Kote Tenouchi - palm leather. Palm can be artificial leather, cow leather or deer leather. Yellow color is artificial, brownyellow cow and white deer. There are high-tech punctured Kote palms which breath more but they are not as durable as solid real leather. 2.Kote Himo - laces. You should hide the extra laces inside the lace holes and between lace itself. Dont let the lace go into your Kote cause it might damage the Kote Tenouchi. Also hanging kote laces are not allowed during competition. 3.Kote Bu/Buton has stiching between interval. It is measured by mm in machine mades or bu in hand mades Kotes. The more there is stiching the more durable is the Kote Bu. So the smaller number is the better giving smaller interval between stiching. There is more work in 3mm stiching than 6mm stiching so the price is of course higher in 3mm. It also makes it harder against hits. More important is the padding inside Kote for the hardness. Kote Bu length is different for big sizes to cover longer arms. Dont take too short Kote Bu so you wont have extra hits to your arm. There are many muscles in hand and you should protect them instead of giving smaller target to hit. 4.Kote Tsutsu - wrist area. Kte has area which will make it to bend along with your wrist. After hand you have a line in wirst and it should be cetered with Tsutsu. You can make Tsutsu more flexible by turning the Kote Gashira around when your Kote is new. 5.Kote Namako / Kera - The chambers. Kote Namako protects your hand but gives the flexibility for wrist. Inside namako is padding and usually it is deer hair, but can be foam. Deer hair is valued allowing your kote to breath. Your kote might have 1 or 2 Namako - the more the more flexible is your Kote. 6.Kote-gashira - the fist. 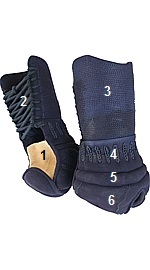 Covers the fingers and has to be in one part only in kendo to avoid injuries. In Naginata there is index and middle finger separately and small and ring finger together. Padding is same than in Namako. Surface can be canvas which breaths well and is fast to dry so it can be washed. Artificial leather (also called Korean leather) is economical and looks like almost leather. High quality indigo dyed cow leather is often used for optimum durability. Some children Kote can have white or black artificial leather which is economical and durable enough for children. Care. You should dry Kote after every use and you should lay them on surface palm streight. Soften the palm leather before use and to remove foldings and your Kote will last longer without holes. Palm can be replaced. 1) Men Gane & 3) Tate Gane & 4) Yoko Gane & 2) Monomi Gane will protect your face and eyes from any harms. It can be aluminium, titan/aluminium or titan. Aluminium is light but in heavy use titan top bars is good to have. Fully titan is for professional kendoka and will last very long. Make sure that your Men Gane is made in Japan (Meijin has only Japanese models) - some Chinese models tend to broke easily. Japanese Men gane has good balance and you wont have pain in neck. The bigger cap on horizontal bars (Monomi) is for your eye level. Vertical bar is Tate-gane and horizontal bars are Yoko-gane(s). 5) Men-dare (side flaps) will protect your shoulders and collar bones from hits and trusts. It is usually made from canvas. Canvas fabric number is from #5000 to #11000. The higher the number the better the fabric is. Edges of the Men-dare is covered with leather or artificial leather. Also there might be some decoration. Korean Men-dare is longer than Japanese model. Men Tare can be stiched diaconal (Naname) so it is flexible from the beginning of the usage and more flexible in use. The front edge is fully covered with leather to make it stronger against hits. Men gane is attached to the side of the Men-dare and covered with black laquer. 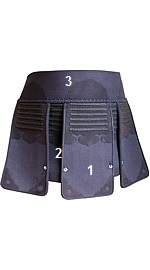 6) Tsuki-dare & 13) Yoojin-dare Tsuki-dare is the throat guard and will protect your throat from trusts (tsuki). Tsuki-dare is under the gane and has to be hard enough to endure all kind of trusts and is valid target. Under Tsuki-dare is extra padding Yoojin-dare which will guide the trust past your throat. 7) Men Chichikawa are the leather string to attach Men Himo (laces) to Men Gane. Normal is to use 2 chichikawa on the 4 bars from down (juniors 3rd). Other option is Kansai style with longer Himos attached with only 1 chichikawa to the Tate Gane (vertical bar). 8) Men Himo - laces Normal is 7 shaku Himo. Kansai style with 8 shaku Himo. Maximum 40cm loops and Himo ends hanging backside when wearing the Men. You should shorten the Himo couple centimeters under 40cm cause Men Himo tend to stretch in use. 9) Men Bu/Buton - the hitting area. Men will protect your head from hits. The target area is at top of your head in front part of the Men from temple to temple. Tenugui Inside Men you should wear Tenugui (scarf) to avoid your sweat damaging your Men and to give more badding to front head. You fold the Tenugui so it will have several layers in front of head. Tenugui also prevents sweat to rinse on your face. Men pad You can get extra padding which can easily be attached under the Men soft inside ring (Uchiwa). This will also change the size for smaller about 1cm. Chin cloth You can use inside your Men to protect Men Uchiwa from damage of face sweat and beard. It is easy to remove and clean. Tare protects you hip area, lower stomach, thights and groins of any hit and/or trusts or misguided handling of shinai during practise. 1. O-dare & 2. Ko-dare Tare has 5 flaps which 3 are bigger than 2 small ones (Ko-dare). Middle is the O-dare which is the place for name tag (Zekken or Nafuda). Edges of Tare is enforced with leather on both sides. Smaller stiching interval will make better durability and protection. Diaconal (naname) stiching can ingrease flexibility and movement. Decoration lines will make Tare to last longer where the flexibility is needed. Tare-himo/Tare-obi - laces (behind not shown on image) will keep your Tare on your hip. You pass the laces behind and make a knot under O-dare while O-dare is raised up. By pulling down the O-dare you cover the knot and hide the loops under smaller flaps. 3. Mae-Obi is the upper part of Tare where Tare Himo is attached. Mae-obi goes under Do and can be seen 2-4cm when you stand straight. 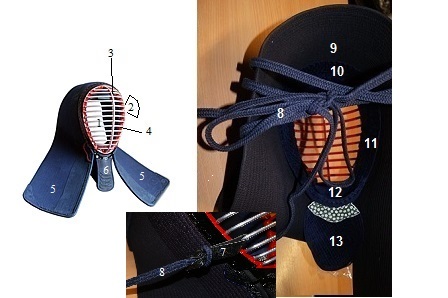 Flaps are attached to Mae-obi. Size Tare should reach just behind your sides in width and under the middle level of thights. Wear You should wear Tare diaconal - front side more down than backside. Do will protect your side from hits and your trunk and chest from trusts. 2.Do-dai Do target area is usually plastic but you can also still find bamboo made. Bamboo needs more care and is much more expensive. Dodai can have bamboo image backside (called Yamato dodai) which is more durable than flat Dodai. 1.Do-mune - upper leather part. Do chest part is leather and continues around the Do Dai. It is attached to Do Dai with leather strings and economical is attached with artificial leather or plastic. We recomend leather for attaching.3.Ko-mune The side leather part on top of dodai can have decoration lines on sides to make it more durable and still flexible there. 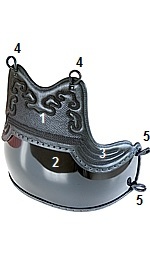 4.Mune Chichikawa & 5.Yoko Chichikawa Do has leather loops (chichikawa) in chest (mune chichikawa) and sides (yoko chichikawa). These loops are for laces (Himos). Size Do Dai should be broad enough to swing after hits so there is some air between body and Do sides. Too small Do will not cover you and too big Do will make your swings and stance (kamae) to be incorrect. Too tall Do will make your Men Tsuki Tare not to move freely.